Parks and products carried the quarter. Disney is spending more than $1 billion (paywall) to build two Star Wars-themed lands in its biggest theme parks. The long-awaited attractions will thrust people into the Star Wars universe, where they can ride on the Millennium Falcon or swig a drink at a hot spot similar to the Mos Eisley Cantina, when the areas open later this year. But the stellar, big-budget attractions are where Disney’s spending stops. The company is so confident that bringing Star Wars to Disney parks will have people pounding on the gates that it isn’t planning to do much to market the new lands. During a tumultuous time for the media industry, when streaming services like Netflix are changing the economics (paywall) of core Disney businesses like TV and film, theme parks have remained a powerfully stable business for the company. Revenue from its parks and products segment grew 5% over the same quarter a year ago, reaching $6.8 billion during the first fiscal quarter of 2019, the company reported on Tuesday (Feb. 5). The segment’s profit rose by 10% to $2.15 billion, which accounted for nearly 60% of Disney’s $3.65 billion operating income for the quarter. Adding in Star Wars to the mix, a beloved entertainment brand, the combination seems unstoppable. Previously, the media networks business that included TV consistently made up the largest share of Disney’s annual operating income. That share has been declining in recent years, as lucrative cable channels that Disney owns, like ESPN, lost viewership from people abandoning cable and traditional TV services. From 2016 to 2017, revenue from parks and products grew by about 3%, and then jumped 7% in fiscal year 2018 to $24.7 billion. Meanwhile, all of Disney’s other businesses, including media networks, studio entertainment, and streaming video, stumbled from 2016 to 2017. 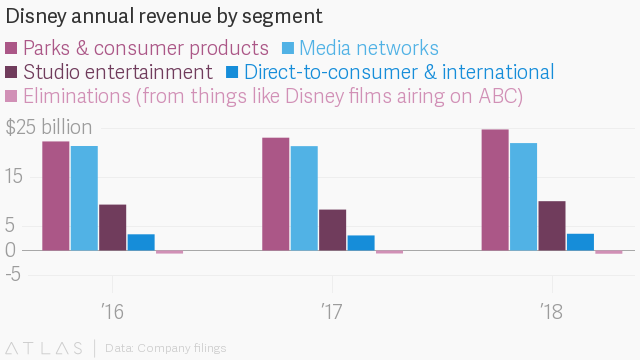 Disney’s media networks business is looking like it’s in better shape, but that’s mainly because losses from Disney’s streaming investments are no longer dragging it down. 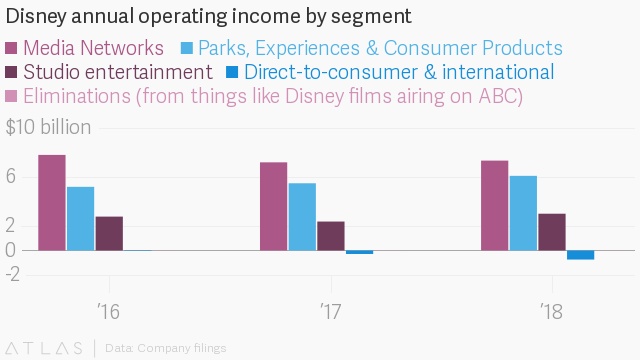 Parks and products have become ol’ reliable for Disney, even as Star Wars movies stumble, ESPN’s subscriber base wanes, and losses in the fledgling streaming business mount. For Disney, they truly are the happiest place on earth.